Mixed martial arts (MMA) is seeing a surge in interest among women across the globe. For both women and men interested in getting certified in mixed martial arts training, the Mixed Martial Arts Conditioning Association (MMACA) provides a cutting-edge online training and certification program. MMA is now a billion dollar industry and women are a fast growing segment. With growing global popularity among athletes and viewers, mixed martial arts (MMA) is now seeing a surge in interest by women: According to Sports Business Daily, MMA may be one of the most popular women’s sports in the United States today, and about one-third of the 18- 49-year-old viewership is women. 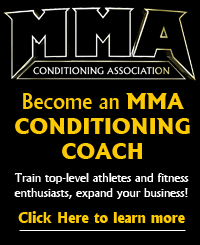 For anyone interested in learning more about mixed martial arts or pursuing a certification, the Mixed Martial Arts Conditioning Association (MMACA) offers online training and certification. More details and registration for the online MMA program are available at http://mixedmartialartsconditioningassociation.com/. The unique program also offers assistance in creating and launching a mixed martial arts training business. The Mixed Martial Arts Conditioning Association was developed to bridge the gap between fitness training, sports conditioning science, MMA training methods, and direct application from the ring, octagon, mat or cage. The training concepts and methods can also be applied to the fitness enthusiast interested in an intense and effective mixed martial arts workout. In addition to growing popularity among women, the MMA recently saw its first transgender athlete as a Fallon Fox, formerly a man, fought in the women’s 145-pound division recently. “At the MMACA, we are all about helping people turn their passion into real results. Whether you want to increase your own strength and agility or help others train for events, we can help you make your dream a reality,” Ellis added. The Mixed Martial Arts Conditioning Association (MMACA) was developed to bridge the gap between sports conditioning science, MMA training methods and direct application from the ring, octagon, mat or cage. The MMA Conditioning Association is the MMA certification division of the National Exercise & Sports Trainers Association (NESTA), a leader in innovative solutions for fitness, nutrition and wellness professionals, as well as club owners since 1992. The MMACA and its staff of educators, exercise physiologists, dietitians, biomechanists, strength coaches, sports psychologists, physical therapists, massage therapists, kinesiologists and business professionals have joined with the world's top boxers, wrestlers, BJJ fighters, Muay Thai fighters, American kickboxers, MMA fighters and coaches to develop a comprehensive MMA conditioning program. For more information about mixed martial arts fitness training, coaching and certification, please visit http://www.mmaconditioningassociation.com.